Disconnecting downspouts can be a very effective, quick and low cost method to prevent flooding and keep rainwater on-site. This video from the City of Portland, Oregon provides thorough directions. If you prefer written materials, download the Downspout Disconnection Program flyer from the Detroit Water and Sewerage Department, which provides step-by-step directions illustrated with photographs. The Chicago Green Roofs website is a comprehensive resource that includes a "getting started" guide, FAQs, a list of commonly used plants, contractors and vendors, and a map of green roofs in Chicago, and more. It is published by the City of Chicago. Installation of a green roof is rated as "hard" for the DYI crowd by This Old House in this step-by-step guide. Anyone considering a green roof would be well advised to consult with a contractor before embarking on a project. The Illinois Landscape Contractors Association has basic information and lists its members who have been through OHSA-mandated training for green roof work. Another source for contractors comes from Green Roofs for Healthy Cities. Under "Find a Green Roof Professional," there are 54 northeastern Illinois firms in the member directory. The site also offers a green save calculator. The Toronto Homeowners Guide to Rainfall: Permeable Paving website offers simple ways to replace some hard surfaces in your landscape to allow for additional permeable, grassy spaces. The Homeowner Guide to Permeable Hard-Scapes, from the Chesapeake Stormwater Network, provides a good introduction to pervious concrete, pervious asphalt, and interlocking pervious pavers. It also includes links to websites with national directories of certified contractors. This 12-page Permeable Pavement Fact Sheet compares the advantages and disadvantages of the three alternatives with a chart format, and includes additional useful information, including cost per square foot estimates for each. Homeowners may want to try their hands at smaller jobs like pervious paver walkways and patios. New Hampshire provides directions for DIYers. Native plants are recommended for gardening to manage stormwater because they take up water in their extensive root systems and they are well suited to the local conditions. The Natural Resources Conservation Service compiled lists of Illinois native plants for different stormwater applications. A more general list of plants native to the Chicago region, organized by light requirements, is available from Chicago Wilderness. The Morton Arboretum's Tree and Plant Finder allows you to search by numerous features, including whether a plant is native to Chicago, Illinois or North America. Information on 80,000 plant species in the southern Lake Michigan region is available through the vHerbarium. The US EPA's "Greenacres" page provides information on several topics about landscaping with native plants in the Midwest, and state native plant lists. The Watershed Forestry Resource Guide explains how trees help to prevent stormwater runoff, and includes lots of links to additional resources. The National Tree Benefit Calculator estimates the amount of stormwater that a given tree will intercept in a year based on species and size, as well as an estimation of total economic value of that tree. "Rain Barrel Guide" is an extremely comprehensive blog about everything you'd want to know about installing a rain barrel and using the collected water. If you can't find an answer, you can submit your question. The Chicago Rain Harvesting Blog has a video with instructions on how to build your own rain barrel. Check out the many interesting posts while you are there. LWVLMR member LWV Oak Park River Forest ran an award-winning community rain barrel program in 2009. In addition to learning about the project, access additional resources and learn how to paint a rain barrel. If your water collection needs exceed the capacity of a rain barrel, consider whether a cistern might be better. The City of Chicago has a helpful guide to cisterns. 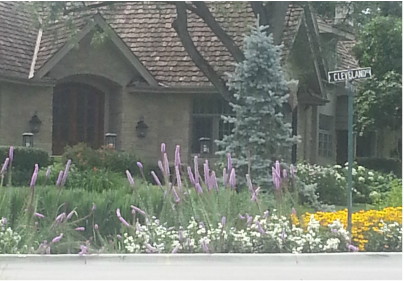 The Prairie Rivers Network provides a simple and thorough overview of rain gardens in Illinois, including reasons why we should be concerned with stormwater. The effectiveness of a rain garden depends on locating and sizing it right. Both Rain Gardens: A How-To Manual for Homeowners and the Rain Garden Handbook for Western Washington Homeowners walks you through the process of designing and building the garden. Or try the simple garden calculator from the Three Rivers Rain Garden Alliance. The City of Madison (WI) rain garden page offers rain garden planting schemes by light requirements (full sun, partial shade, full shade) and preference for formal or informal gardens, and additional helpful information. Sometimes bioswales are used in conjunction with or in place of rain gardens on residential lots. A brief introduction is offered by the Upper Des Plaines River Ecosystem Partnership. (See more information about bioswales on the Neighborhood Solutions page).